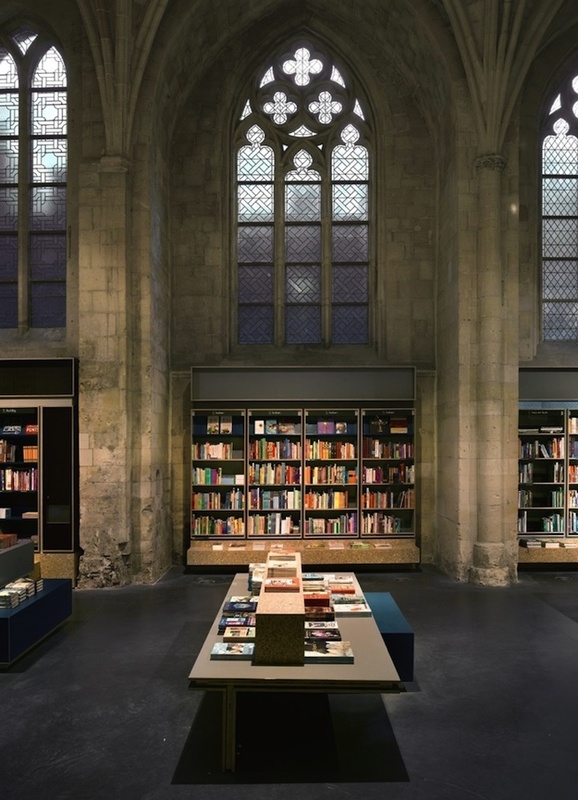 A friend showed me these photos of this bookshop in a disused 700-year old church in Maastricht, designed by architects Merckx + Girod. Wow. Would love to see it with people in it. 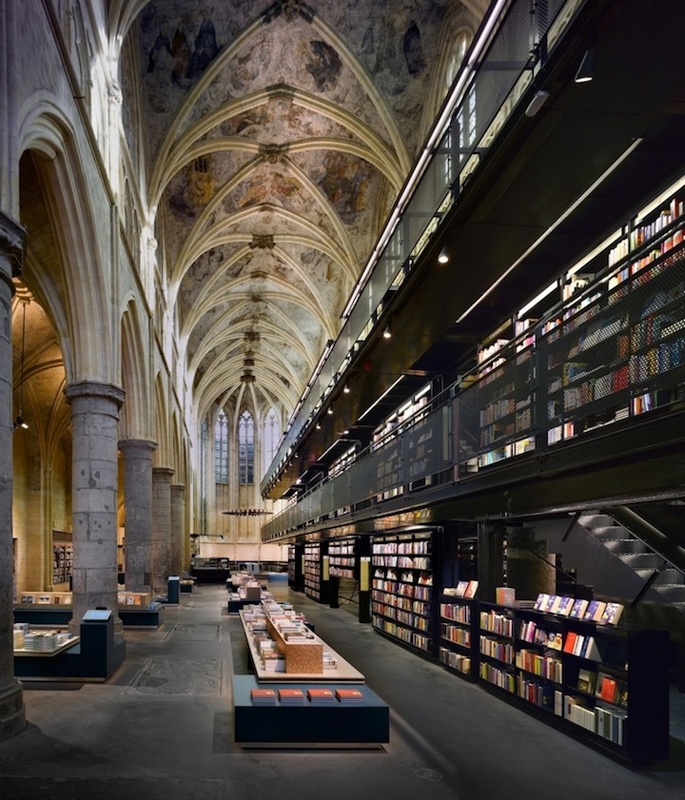 We can’t compete with this, but there is a sense of fellowship among bookshops! The lovely Liane from Radio Warwickshire stopped by today to catch up on Tree House news – she interviewed me on the market stall before the premises had been acquired, and came to see how it was all going now we have a shop. The official opening day for The Tree House is now set for Friday 26 July. 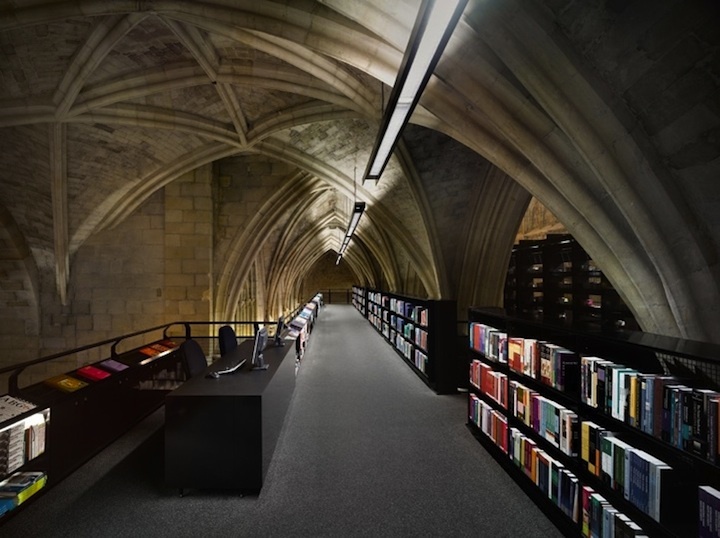 Not sure if we’ll be entirely ready by then, but we’re going to open anyway… As long as we have books on shelves and a body to unlock the doors and welcome people in, there’s no point in delaying any longer. We might even try to sell the odd book! The mayor is due to open the shop, but if she is not free that morning, we will have an official opening when she can be there – but the doors will open for trading at 9.30am. The shop will be open Tuesday to Saturday, 9.30am to 5.30pm, closed on Sunday and Monday – I hope to extend those hours eventually, but that’s where we will start. 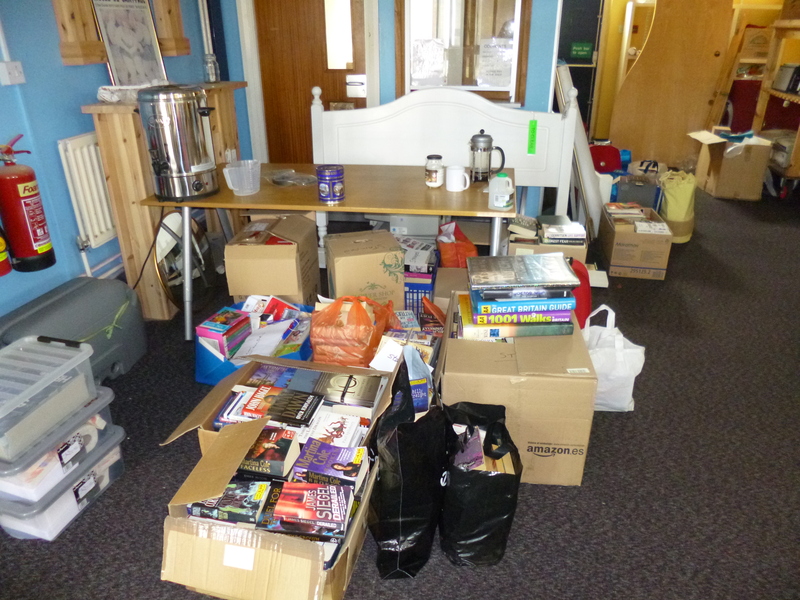 Availability of tea and coffee still needs to be sorted out, as do a few other details, but we will have books, places to sit and a programme of evening events – all we need to get started. Do spread the word, share on Facebook, retweet, or just be radical and simply tell your friends and colleagues about it. The Tree House is at heart a second-hand bookshop; that is its reason for being. 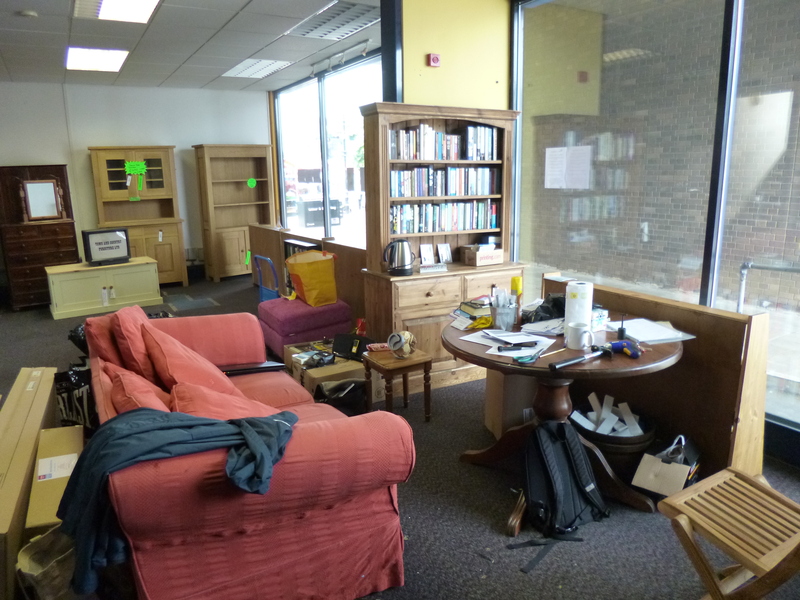 Around that we are planning to use the physical shop as a space to bring people together in various ways. We hope eventually to make a profit, and when we do, those profits will be given to local charities and community events. The overheads – which are reasonably substantial – will include a wage for me as full-time manager, and hopefully in due course will include wages for a couple of members of part-time staff, to keep it all running smoothly. None of us are planning to make millions out of it, it is intended as a means of supporting the community both financially and in other ways, but it is also to be my full-time job. 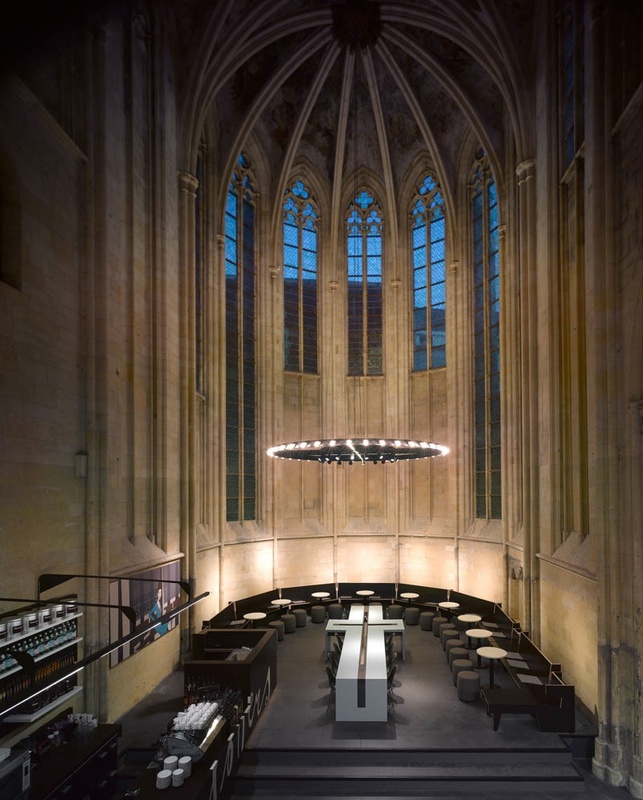 Our first evening event is the celebration mentioned previously, an evening of storytelling and jazz on opening day, Friday 26 July from 7.30pm to 10pm (if you click on that link, there is a taster of the fabulous jazz band who will be playing). This is free of charge, but there will be a limit on how many people we can get in the shop! And any donations on the night towards costs and start-up funds will be graciously and willingly received – though the main thing is that people enjoy themselves. I’ll put up a poster about it here very soon, and there are details on the Tree House Facebook page (which you can view even if you are not on Facebook) and on the website. I am away teaching in Oxford from 13-20 July, so that gives me about two weeks to get it all shipshape…what larks, Pip! Here are a few things I need for The Tree House…any suggestions very welcome! I can find all these things in Yellow Pages and elsewhere, I know, but it’s good to get recommendations, and to find people who won’t charge the earth. Of course I’m happy to pay going rates, but it’s all such a minefield, and I thought I’d ask in case anyone could give me some contacts! 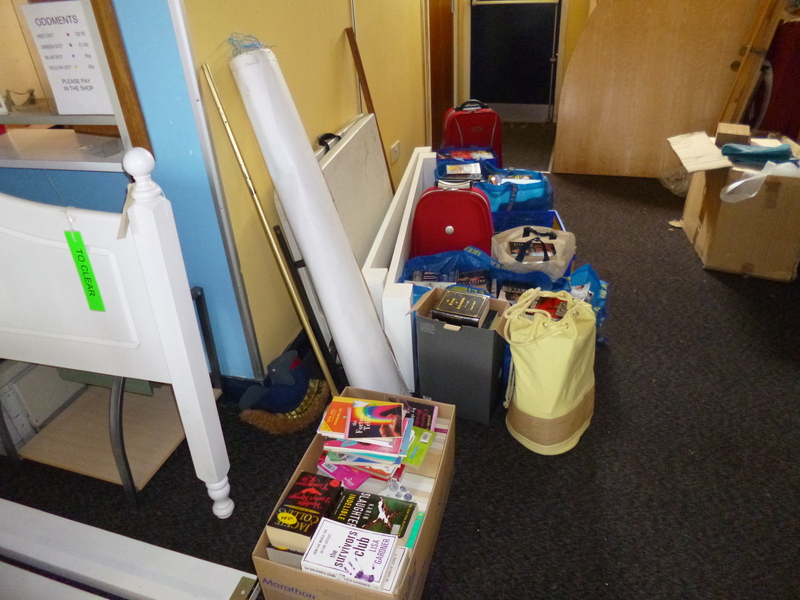 Thank you so much to all those who have donated books, furniture and time so far – you have been amazing. 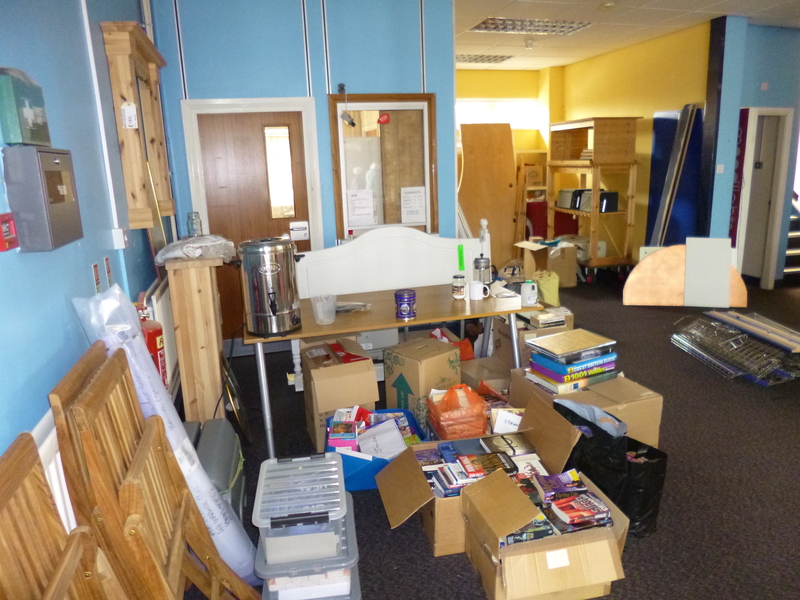 It’s all beginning to take shape – still some furniture to be removed from the shop, but hoping we will soon have all the space available. I still need bookcases, or bits of furniture to act as book displays, but am going to the Lions store on Saturday, otherwise will buy more cheap bookcases until we can afford something a bit more robust. Please let me know if you can help with any of the above – nothing major needs doing, just a few things to tidy up and check. Thank you! Friday 26th July – the telling of tales and all that jazz! The Tree House is not yet open, but it’s getting there! 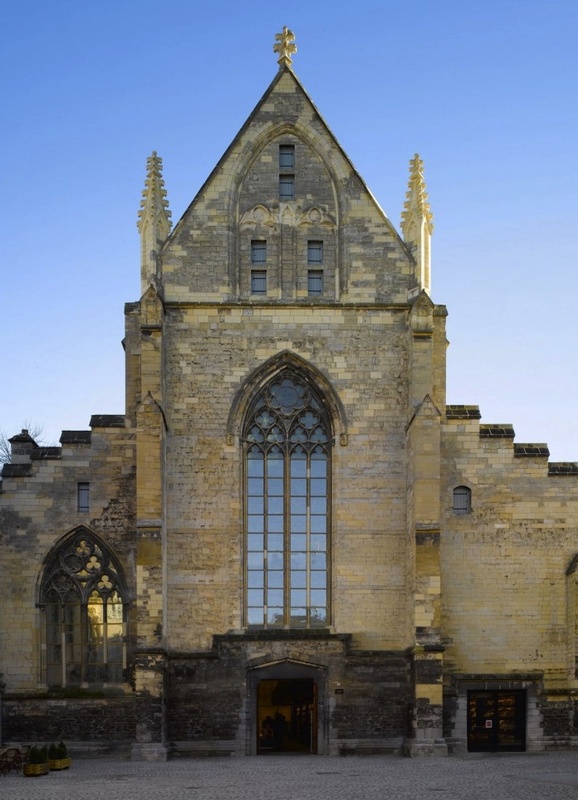 It’s going to take another couple of weeks to get things ready – and as I am away for a week in mid-July (a long-standing teaching commitment in Oxford), it seems a bit daft to open it and promptly close for a week, so the proposed opening date is sometime in the week beginning 22 July. The shop will be open Tuesday to Saturday to begin with, closed Sunday and Monday. One day we might be open seven days a week, but let’s see how things go! But whatever date we open, the Tree House diary does already have one firm entry – Friday 26th July, when we will be hosting an evening of storytelling and music to celebrate our opening. Storyteller Stephe Harrop will enchant us with tales of the forest…if you haven’t heard an adult storyteller (ie telling stories for adults rather than children’s stories), come and experience how magical it can be. The act she is doing for us is called Imagine a Forest…, and she weaves stories around some traditional European folktales. The forest is a potent image in folklore and fairytales, and very much reflects the background to the Tree House – one of the reasons I was determined to get trees into the shop name! She will be followed by a reduced version of the incredible Spicy Jazz, a group of top professional jazz musicians. There are usually six of them, but because of the size of our venue they will probably be a trio – trombone/vocals, double bass, sax – though the line-up may change a little. They will be fantastic, and after the quiet magic of Stephe’s performance, they will get us in a more outgoing, celebratory mood. Two of them are also authors of non-fiction, so there is a bookish connection! They are both in fact academics and will talk about their books as well as play fabulous music. 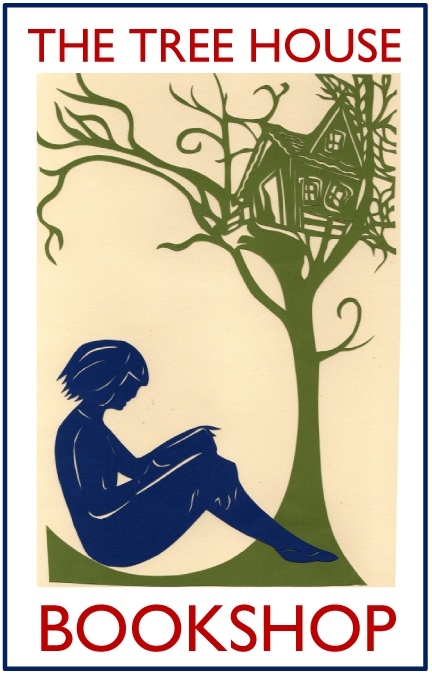 This combination sums up the Tree House for me – the magic of books and stories, the community-enhancing power of music and the arts generally. So put the date in your diaries – there will be no tickets, but donations on the night towards the costs and the Tree House start-up funds will be very welcome! I will put together some publicity soon, but for now, here is a bit of Spicy Jazz from their recent concert at St Nicholas Church to whet your appetites. Tomorrow (Saturday 22 June) I am having a day in the shop with some volunteers (perhaps! 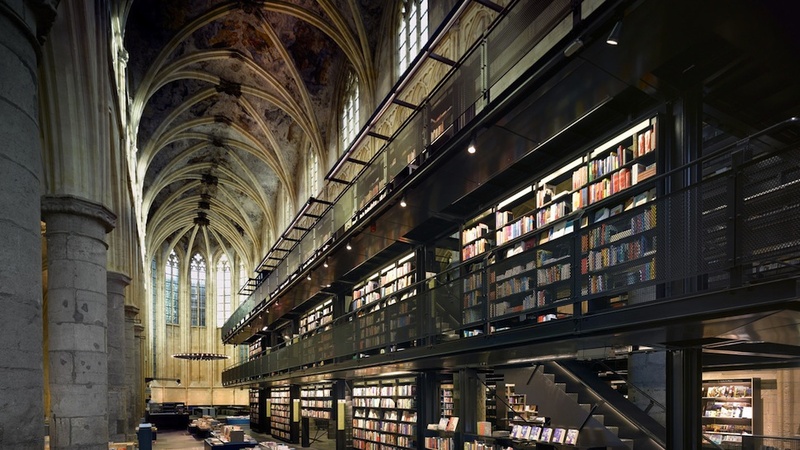 ), and am hoping to put together a few more flatpack bookcases and start to plan where to put them – some will obviously go round the walls, but am starting to think about how to divide up the central space too. 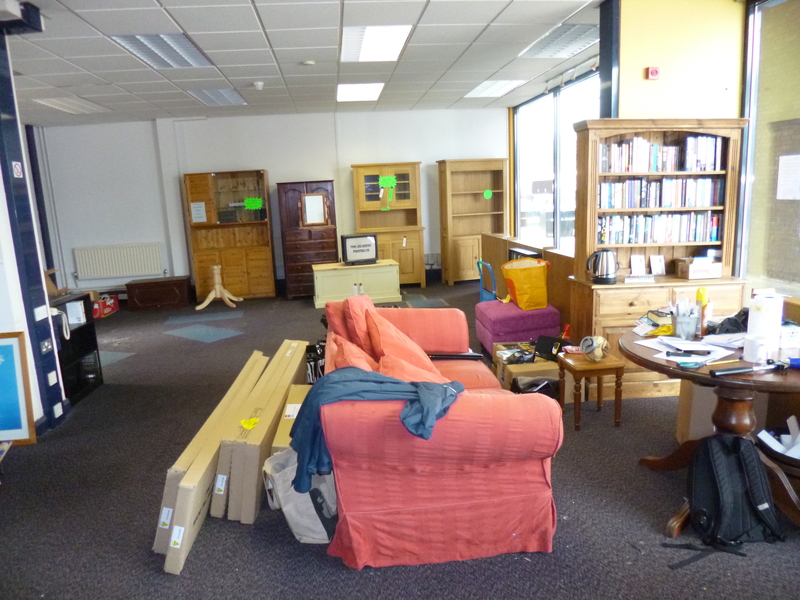 A couple more bits of furniture were brought in today, a lot more books were stamped, and it’s all gradually taking shape – though still quite a way to go. I have no idea who might turn up tomorrow, if anyone other than one person who has promised to be there, so we’ll see! But any progress is good, and we are making some each day. If you want to help out tomorrow, do just come along to the shop – I’ll be there from about 9am to about 3pm. If all goes to plan this evening, there will be cake! I also need a plumber – if anyone local can recommend a reliable and not-too-expensive plumber, do let me know! Just a couple of leaks that need checking, and a wall-mounted water heater that may or may not work. I probably just haven’t found the right switch for it! Plus anyone handy with a drill, to help fix bookcases to the wall, would be a welcome addition to the Tree House fold. Anyway, off to make a cake and read and edit an online course someone is writing on Impressionism – the work that actually pays me money still needs doing! The rest of what Lisa stamped. And a few oddments…the bed is not part of the Tree House, sadly! My cosy corner – the furniture in the background is gradually being moved out, all the stuff in the foreground is Tree House furniture. 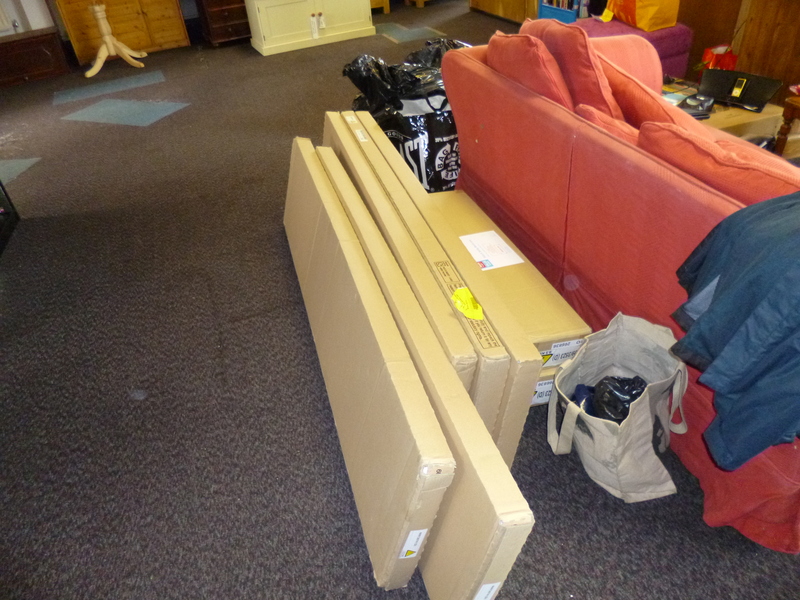 Bookcases waiting to be unpacked and constructed. 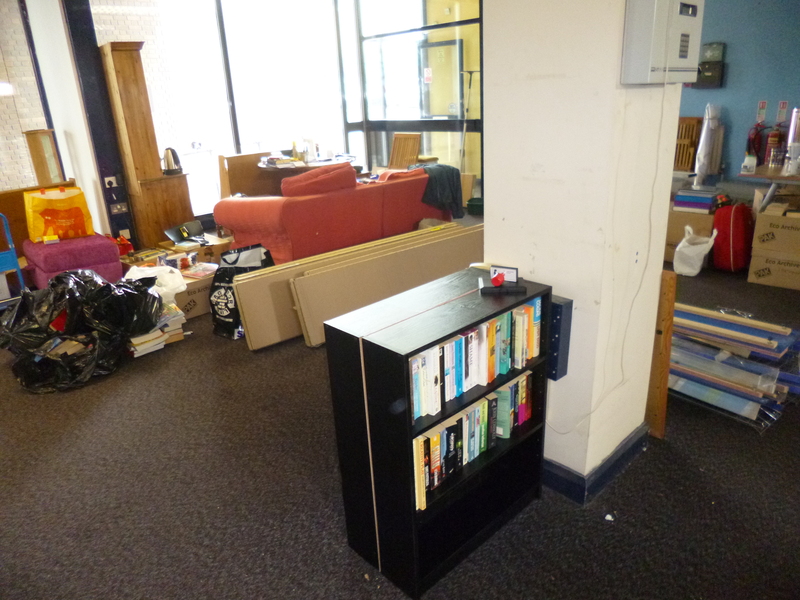 Little bookcases – hurray for the electric screwdriver. Starting to think about where to put them. 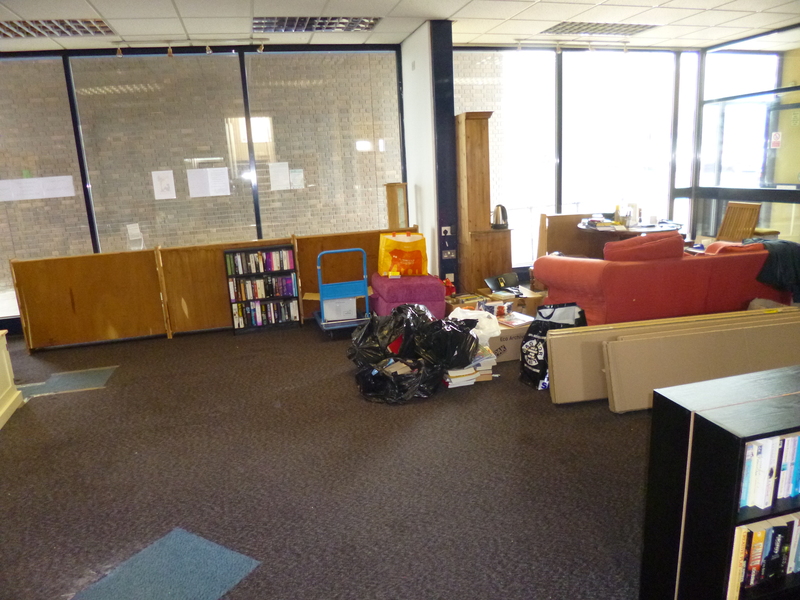 Quite empty at the moment – hope to keep it quite an open space, but it’s definitely lacking bookshelves just now! Ordered chaos. And an urn! One more look across the shop from the entrance.